We had a surprisingly busy spring this year. Wife and I have been distracted by a home renovation project that will soon become the focus of our lives, and probably the focus of some posts, too. Add to that the other life stuff that happens every day and here we are already in June. Because we were so busy, we decided to keep Sweetie’s birthday party low-key this year. Tough to do in general, but she has been attending parties for classmates and friends and that just adds to the pressure. Needless to say there was not much to post about from this year’s party. It was nice and all, but nothing like last year. So I decided to take you all back..
Sweetie chose a Curious George theme for her 3rd birthday. 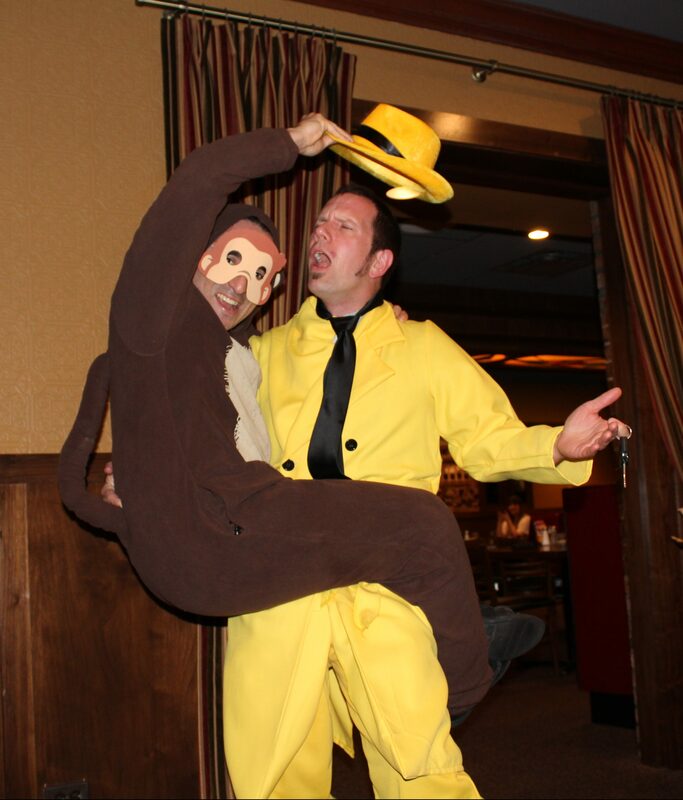 That was great because there is plenty of stuff at the local party store for Curious George – he’s a popular little monkey. Sweetie’s godfather, Micompadre, upped the party ante though when he asked/suggested/challenged me to dress up to fit the theme. 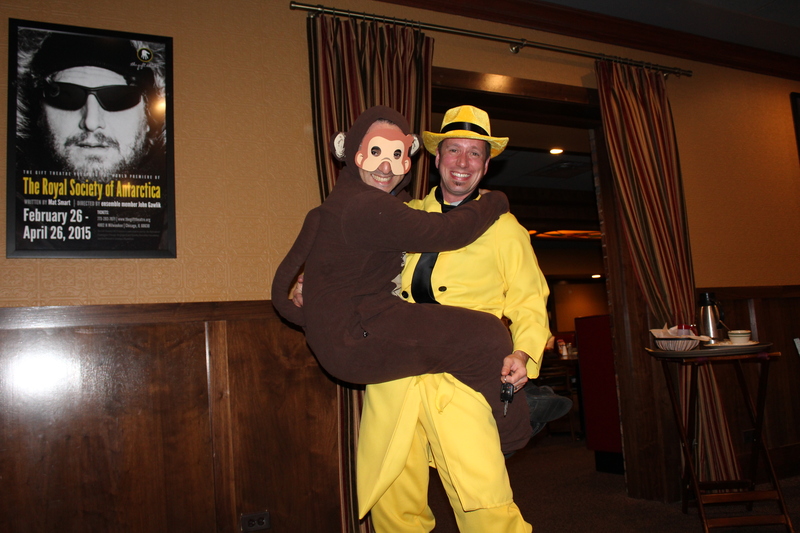 Micompadre let me know that he owned a monkey suit and would happily join me in the fun, as you can see. With his support, and a giant costume store just down the street, it was on. 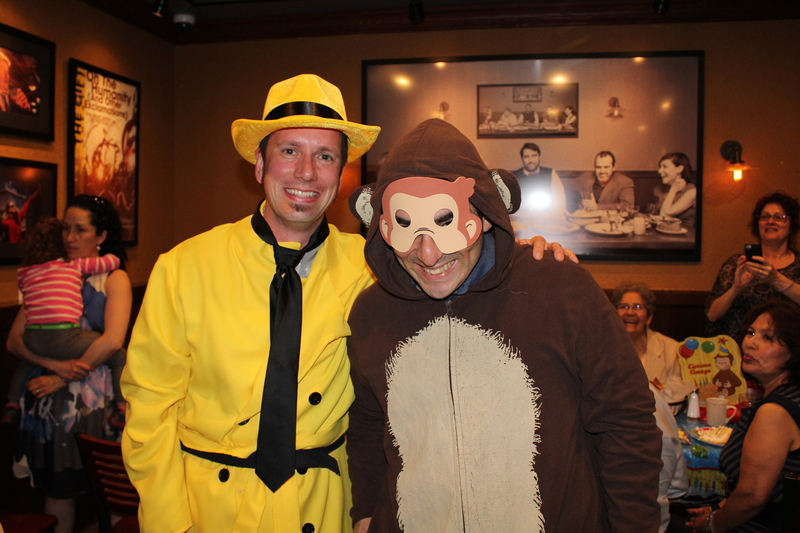 Curious George and the Man in the Yellow Hat were in attendance. Now despite the obviously high quality of our costumes, not all of the kids loved it. In fact, many of them had a look that was either incredulity or horror. We kept moving and didn’t stay in front of any child too long in order to avoid breakdowns. And thanks to the quality costumes and unseasonably warm day, our time in costume was quick. I have to give all credit to Micompadre. Without his push I would not have added this to our party planning. There are wonderful and fun places to go when family supports you. So something else to add to the list of things I didn’t see myself doing: cosplay for a birthday cause. But the parents out there are not surprised; they’ve done it too. To the would-be dads: expect to wear many different hats as a father, some that you never thought you would even consider. I think this is especially true for a stay-at-home dad. But when you see your little girl’s face light up, and the mood of the party shifts to “fun-silly”, it’s worth it. Hello Readership! This post goes out to all the committed Dads out there, stay-at-home or otherwise. From all of us here at Dad’s Diaper Detour, Happy Father’s Day! This is your day, dad, to spend it however you want doing whatever you want. That being said, I know you will probably be driving all over bringing your kids to visit various male relatives, possible grilling for lots of family members and enjoying many well-deserved ties and coffee mugs. Maybe that’s just a preview of my day? Anyway, that’s all a part of this adventure of fatherhood, right? And hopefully we are growing into this role with the grace that our elder men demonstrated. Enough silly banter, though. I sincerely wish all of you a day filled with family and friends and overall good sentiments for the job you are doing well. Happy Father’s Day – now back to it!